SILVER NECKLACES : BRITISH Made : LOVE2HAVE in the UK! The BEST! Quality women's handmade silver necklaces in the UK at prices you can afford, fully guaranteed and returns accepted. Now we at Love2have know without a shadow of a doubt that we have lots of homegrown talent here in the UK producing unusual handmade silver jewellery and we want to support that talent. Contrary to what many people believe, it is possible to buy a quality piece of silver for just a little more than what you might expect to pay for a mass produced item. Our women's handmade silver necklaces are one such example of this fact, and they go with just about any outfit, which is why we have put together this diverse range of silver necklaces all specially handpicked for women. We have attempted to source some unusual designs that are not readily available from any large brand Internet store, and our women's jewellery on this page will compliment any outfit from jeans, a shirt to that little black number for that particular occasion. Silver is also popular as wedding jewellery for the bride and bridesmaids, and some pieces including the silver flower pendants are just perfect. There is something here for everyone from clean and contemporary styling in the form of silver pendants, all the way to the ornate and the very alternative too. Because the jewellery is made here in the UK, we can cater to a much wider range of different sizes. We can accommodate the chains and the necklaces in various sizes and not just the measurements specified on each product listing. So, if you don't fit into the category of average, don't worry because we don't produce everyday jewellery. Just contact us first before you buy, and we are sure that we can help you out. Check out our exciting range of men's silver necklaces also. 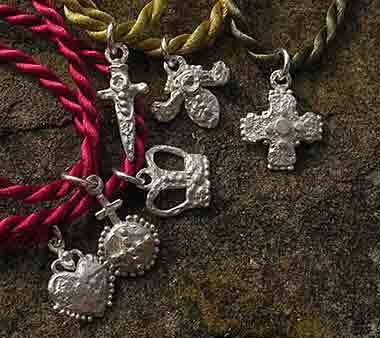 Prefer a non-leather version of one of our leather and silver necklaces? We strive to endorse both moral and ethical values and none more so than in the vegan trend that is taking the world by storm these days. Vegan choices in diets are commonplace now which is why we at Love2Have are more than happy to assist you in purchasing a vegan option to any of the leather products on our website. If you see anything featuring leather, then contact us NOW! For your very own unique vegan alternative.